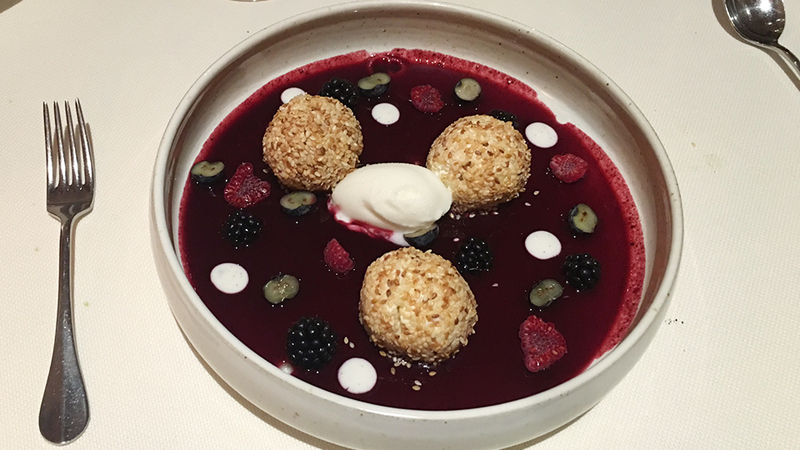 There are numerous reasons why I recommend having lunch or dinner at JY’s in Colmar, in the heart of Alsace’s Haut-Rhin wine district. For one, it is (easily) one of the two or three best restaurants in Alsace, with precise, flavorful and complex dishes that are not, as so often happens today even in much-acclaimed dining spots, a pile of fancy-sounding ingredients just thrown together in the hope or the misguided conviction that something good is bound to happen (it never does). The elegant, relaxed setting is yet another reason to visit; in the warmer months, I especially recommend eating outside, in a particularly pleasant and romantic space hugging one of the many pretty canals of Colmar’s Little Venice district. Last but not least, the slender wine list (which should be improved and expanded somewhat) offers plenty of good choices, so readers won’t go thirsty. Chef Jean-Yves Schillinger, who must have been told a million times he looks like a little Gordon Ramsey, trained in his lifetime with a real “who’s who” of the restaurant world, including the likes of Boyer, Bonin (of Crillon fame) and Robuchon in Europe, and Jean-Jacques Rachou of La Cote Basque in New York. Schillinger’s experiences were such that they allowed him and his partners to create a calm, cozy, contemporary-styled and very refined restaurant at JY’s that holds great appeal with well-heeled local and cosmopolitan patrons alike. All in all, a well-deserved success, and a payback of sorts for the hardships that Jean-Yves Schillinger had been previously forced to endure. For things in the young man’s life began to unravel on December 27, 1995, when the well-regarded family restaurant, Schillinger, was set ablaze while his poor father Jean, who was asleep inside, perished. Finding a solution to the crime proved a difficult task, and the matter was only resolved in January 1999 with the arrest of three people. But meantime, during the years it took for the investigation to finally come to a conclusion, life for Jean-Yves Schillinger had became untenable in the area and so he packed his bags and left for New York along with his wife Kathia. 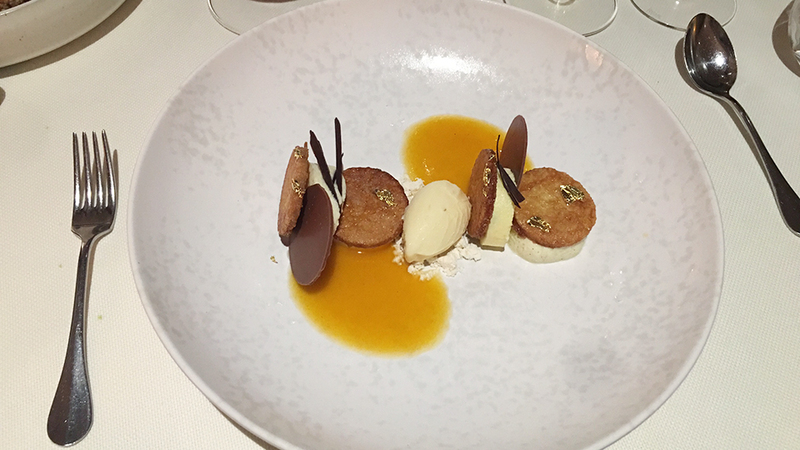 In 1998 he opened the restaurant Destinée, and then a second, l’Actuel (which later morphed into l’Olica). Schillinger’s stay in the USA lasted seven years, until he was finally ready to move back home, which he did in the early part of the new century, ready to start life anew in his native Colmar with the opening of JY’s. No matter where you dine at JY’s, either inside at one of the elegantly appointed tables on one of the two floors of the restaurant, or outside by the river’s water, you are in for a treat. I first ate at JY’s soon after it opened and have been there numerous times since (five times just in the last two years) and have yet to record a disappointing evening. 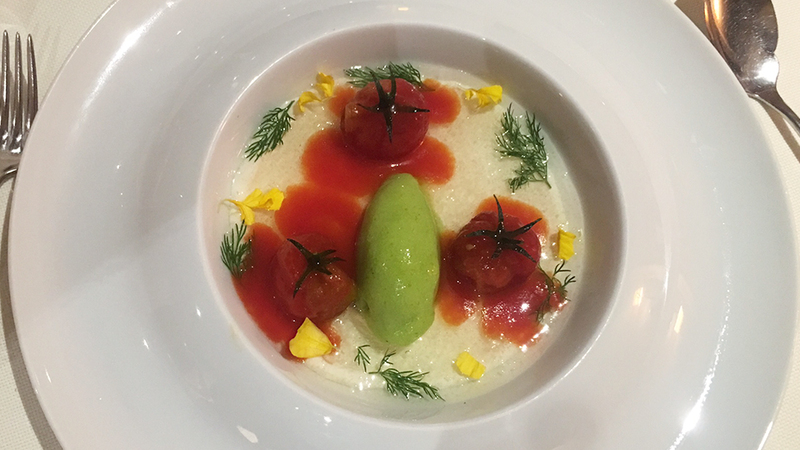 On this night the tomato appetizer was tasty, refreshing and inventive, while the ris de veau springy and perfectly cooked. Desserts boasted intense aromas and flavors, while very light on their feet, and were a perfect ending to a complex, articulated meal. 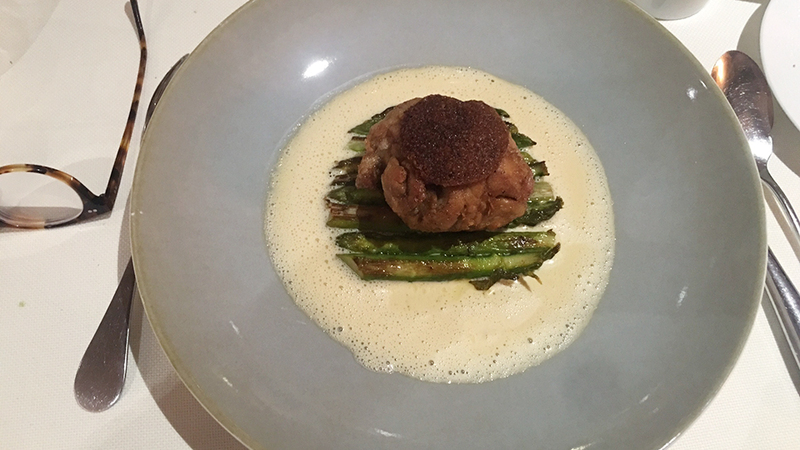 Schillinger’s interpretation of the classic ris de veau is a telling example of his cuisine: the aromas and flavors of the very good; soft morsels of meat were kicked up a notch by the addition of the masala sauce, which perfectly complemented and heightened the delicate and slightly earthy flavors that typify ris de veau. Masala sauce, a tomato and spice-based sauce from Rajasthan in northern India, exists in a plethora of different versions (one recent survey described no less than forty-eight distinct recipes with wildly different ingredients used, though most everyone seems to agree it’s a perfect foil to chicken; as in chicken tikka masala, where tikka means “pieces”, marinated in yogurt and herbs and skewered or left as chunks cooked over charcoal). At JY’s, the complex blend of spices in the masala sauce might include cinnamon, cloves, turmeric and ginger; but no matter its exact composition, the sauce at this restaurant really lets the ris de veau explode in the mouth with very much lifted juicy fragrance. The wine list at JY’s is good but could be better, given the level of the food. Newly arrived sommelier Yann Van-Neuwenhove will hopefully be allowed to add more names (especially from Alsace) and older vintages too. A real positive is the selection of half bottles, which, though not huge, is very competently drawn up, with some really great wines to choose from. Availability of smaller bottles at lunch or dinner is always a real plus on long days of travel and winery visits. And so that is exactly the direction I took on this night with three lovely 375 ml beauties. The floral delicately fruity and already very forward 2011 Domaines Schlumberger Riesling Grand Cru Saering speaks clearly of the warm vintage and the vineyard’s deep sandstone-stony soil layered over sandstone- and calcareous-marls. It is drinking very well already now, offering a chewy mouthfeel of stony licorice and pomaceous orchard fruit flavors and white flower nuances. 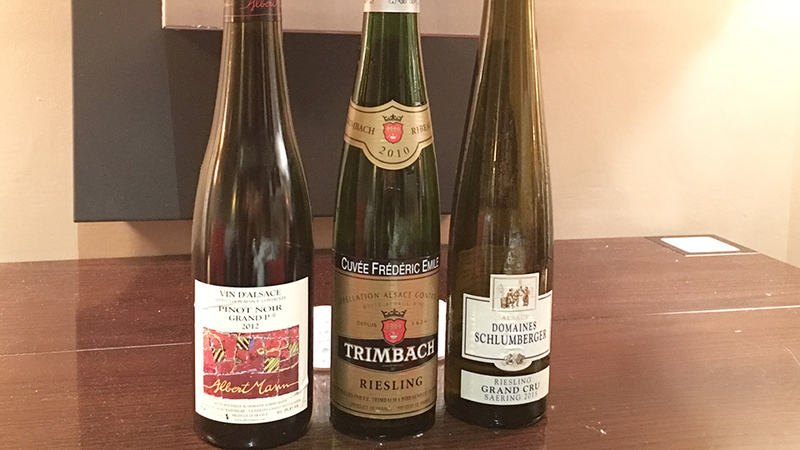 The 2010 Trimbach Riesling Cuvée Frédéric Emile is a classic in the making, with lemony and stony echoes to the apple, lime and pear aromas and flavors. This will keep for decades in a good cellar, but bottled in the 375ml format it proves surprisingly approachable. Alsace has been making improved Pinot Noir wines for a number of years now, the result of better clonal selections, attentive massal selections from Burgundy and climate change. Most wine lovers and experts generally agree that nobody does Pinot Noir better in Alsace than Muré and Albert Mann; the latter estate makes as many as four noteworthy Pinot Noirs. The 2012 Albert Mann Pinot Noir Grand P is so-called because the grapes grow in the Pfersigberg grand cru. Although 2012 is not a favorite vintage of mine, this is a perfectly fine, perfumed red, if currently a little folded onto itself, with the tannins coming across as rather tough. I wouldn’t touch another bottle for another three or four years. I had a great meal on my most recent visit to JY’s. 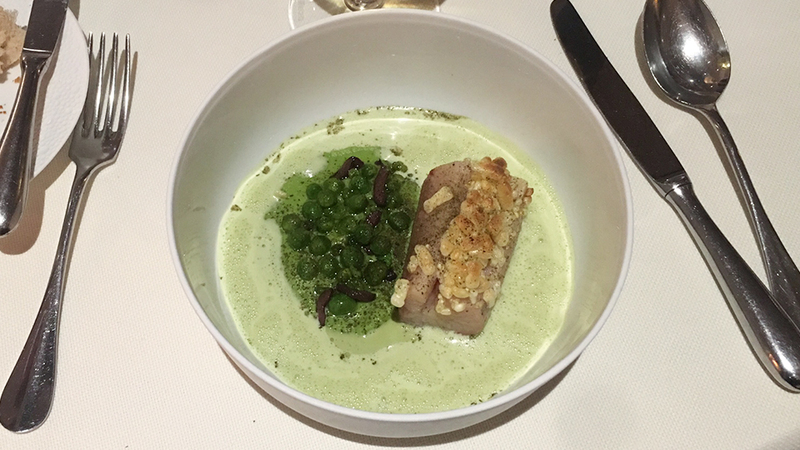 All the dishes offer an interesting combination which is part years of training in classic cuisine techniques, part use of exotic ingredients (such as wakame algae, bok choy, curries), and part wholesome recipes deeply steeped in France’s culinary traditions and history (foie gras, ox tail, consommé, pissaladière, ris de veau). Schillinger’s creations are imbued with a clarity, airiness and precision that only come with experience. At JY’s, the food, like the setting, are top notch, and prices, though not low, are not especially steep for a restaurant of this quality. Also, I have no doubts that Van-Neuwenhove will help improve the wine list in terms of both names and depth of vintages. But that small caveat aside (which JY’s shares with no less than l’Auberge de l’Ill, in fact), I strongly recommend a stop at JY’s when your travels next take you through Alsace. It really is a memorable dining spot, in memorably beautiful Alsace.